Some might know that I spent most of 2015 trimming down my game collection and, while I kept pretty much up to date with updating my Trickylight and Boardgamegeek databases with the changes, I did notice quite a few discrepancies from games that had left the collection in earlier years. So I’ve spent the past couple of days straightening things out and it appears I now own just 617 games (having been well over 1,000 at the start of the year). I’ll probably still look to trim that number further during 2016 but not to the same extent as this year’s effort. One game has curiously gone “missing in action” as I’m certain I’ve not sold it and yet I can’t find the game anywhere. 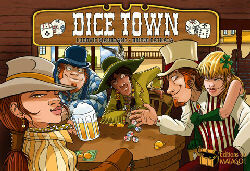 If anyone knows what might have become of Dice Town, please get in touch and put me out of my misery. I’ve also played around a bit with the theme on this blog so let me know if you like it. Garry Lloyd on Is it my move yet?